Four Seasons at Gold Hill in Fort Mill, South Carolina offers the perfect blend of small community feel with big community amenities. Residents of this 301-home community enjoy the tight-knit neighborhood, which includes a 12,000 square-foot clubhouse and other great amenities. Active adult homebuyers enjoy living in low-maintenance homes that allow them more time to enjoy their vibrant lifestyles. The community clubhouse in Four Seasons at Gold Hill is the central hub for all community social and fitness activities. It includes a fitness center, hobby rooms, library, billiard room and outdoor pool and spa. A tennis court, putting green and a patio with a grilling area surround the clubhouse. On a warm day, the outdoor pool is the perfect place to cool off with friends and neighbors. There are many more amenities at Four Seasons at Gold Hill that continue throughout the community. The outdoor pavilion and garden is a great place to relax. Taking advantage of South Carolina s mild climate is easy with the scenic walking paths that are found throughout the community. Built between 2003 and 2007, Four Seasons at Gold Hill encompasses 301 low-maintenance homes developed by K. Hovnanian. Homebuyers can choose from many different styles of pre-owned homes. There are 112 attached townhomes inside of Four Seasons at Gold Hill. There are 33 buildings that are made up of two, three, and four units. There were four townhome floor plans that offer approximately 1,392 to 1,969 square feet of living space. The remaining homes in the community are 189 single-family homes offered in 14 floor plans that range from approximately 1,480 to 3,420 square feet in size. Many homes feature two to three bedrooms, two bathrooms, and an attached two-car garage. An on-site activities director keeps Four Seasons at Gold Hill s calendar filled with fun events and activities. Residents of Four Seasons at Gold Hill have a well-organized social committee that is continually enticing residents with new and exciting activities. Neighborhood parties, social events and day trips to local attractions are a common occurrence in Four Seasons at Gold Hill. Plus, there are numerous clubs and interest groups that include everything from arts and crafts to tennis and bowling. Four Seasons at Gold Hill enjoys a magnificent location in the heart of Fort Mill. The community is just minutes to Lake Wylie, which is a 12,500-acre lake with 325 miles of shoreline where residents can enjoy great fishing, boating and swimming. The Charlotte-Douglas International Airport is an easy 25-minute drive from Four Seasons at Gold Hill. Charlotte is just as close with many activities throughout the year. Residents enjoy attending sporting events at the Panthers or Bobcats games, Broadway shows, and museum tours. 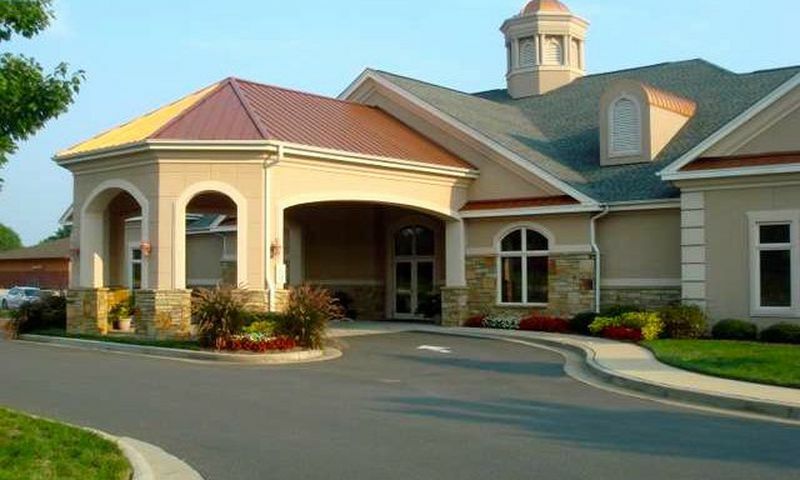 Located on the south side of Gold Hill Road and a mile west of Interstate 77, Four Seasons at Gold Hill is a wonderful active adult community in a convenient location. There are plenty of activities available in Four Seasons at Gold Hill. Here is a sample of some of the clubs, activities and classes offered here. K. Hovnanian built 112 attached townhomes inside of Four Seasons at Gold Hill. There are 33 buildings that are made up of two, three, and four units. There were four townhome floor plans that offer approximately 1,392 to 1,969 square feet of living space. Please note: not all floor plans are listed below. There are 189 single-family homes inside of Four Seasons at Gold Hill. K. Hovnanian designed 14 floor plans that range from approximately 1,480 to 3,430 square feet in size. Many homes feature two to three bedrooms, two bathrooms, and an attached two-car garage. Please note: not all floor plans are listed below. As a single woman I love many things about this community. First, it is gated so it feels safe. Second, the house fit my budget, just over $200k. Third, there are lots of clubs to join and it's easy to meet new people. I really enjoy being a part of this friendly neighborhood. Moving to the Four Seasons at Gold Hill last summer was the best move my husband and I could have made. And if it weren't for our fantastic real estate pro, we wouldn't have found the home in this community that we are so happy with. The agent is very knowledgeable of areas in both NC and SC, knows the 55+ communities intimately, and is a true professional from the first showing, through the sale, and finally through closing. We're very happy to recommend this agent to anyone looking for someone they can rely on to help them through the process of relocating. 55places.com is not affiliated with the developer(s) or homeowners association of Four Seasons at Gold Hill. The information you submit is distributed to a 55places.com Partner Agent, who is a licensed real estate agent. The information regarding Four Seasons at Gold Hill has not been verified or approved by the developer or homeowners association. Please verify all information prior to purchasing. 55places.com is not responsible for any errors regarding the information displayed on this website.